Carrot cake offers the best of both worlds: an indulgent treat with a serving of vegetables. 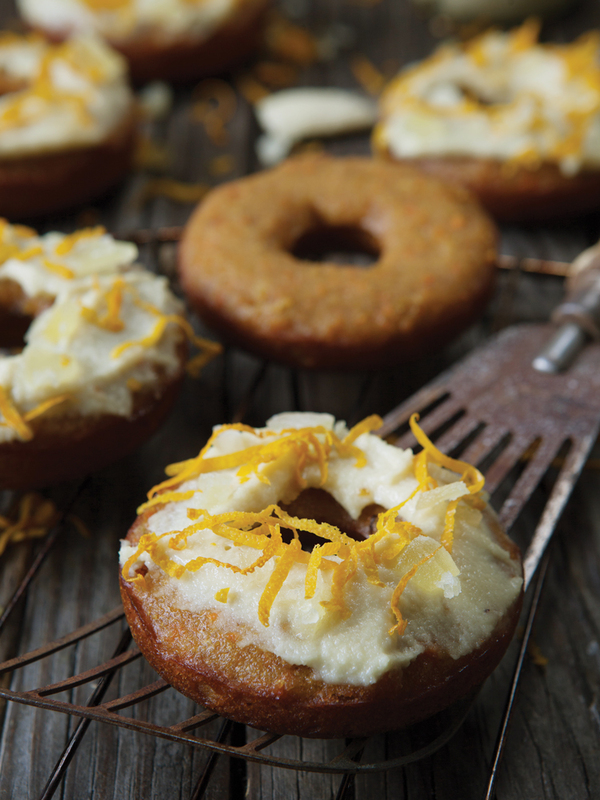 In her book Nourish & Glow: Naturally Beautifying Foods and Elixirs (Countryman Press, $20), holistic wellness coach Jules Aron puts a nutritious spin on the dessert with her recipe for vegan carrot cake donuts. Baked instead of fried, these guilt-free delicacies get their sweetness from maple syrup in lieu of sugar and owe their moist texture to almond butter and—of course—carrots, which are high in vitamin A, a key component to regenerating collagen and promoting strong eyesight. Preheat oven to 350 degrees and grease donut pan. Drain and rinse the cashews and process in a blender or food processor. Add orange juice, maple syrup, and ginger, and half of the orange zest, and blend until smooth and creamy. Transfer to a bowl and refrigerate. Whisk together carrots, coconut oil, maple syrup, vanilla extract, and almond butter until well combined. Add in water, flax, almond flour, and baking powder, and mix well. Pour mixture into pan and bake for 12 minutes, or until a tooth pick comes out clean. Allow them to cool before removing from pan. Using a spoon, gently spread the glaze on top of the donuts. Top with the reserved orange zest.